A matching study of those who smoked at time of start of study 20 or more cigarettes per day (ages 40 to 79) matched for 9 contraveining variables with those who never smoked--source veterans hospitals. Statistics were gathered for 15 years. A reasonable quantification of the risk for those who follow the pattern, and quite easily adjusted for those who smoking habits differed from the average of the sample. Following this article is JK's explanation of selected important concepts concerning cancer. This space is for those friends of mine who have or will die before they should because they could not follow the dictates of reason. My father endured 23 years of bad health. He smoked and had his first heart attack at the age of 53. Terry, another smoker, died of lung cancer at the age of 52, He died in September of 2002, when the cancer matestized to his brain. Billy Dole died in 1999 of pancreatic cancer, he was 45. Smoking put all three of these men in a much higher risk categories (JK). Nonsmokers and smokers were match by age, race, height, education, religion, nativity, alcohol consumption, residence, occupational exposure, sleep, exercise, and severe nervous tension; viz., all factors found to affect the incidence of cancer. The study was of 36,975 who smoke 20 + cigarettes daily at the time of enrollment in the study in 1959, and were 40-79 years old. They were matched to 26,975 men who never smoked regularly. It should be noted that the primary tissue (source) of the cancer is listed in this table. Cancer is the result of a series of mutations that confer on one cell line (a single cell) a number of properties for which the limits have been inactivated. Among them is the growth of new capillaries, necessary to support the continued growth of the cancerous clump of cells. Without this ability the abnormal cell will never grow into a large invasive mass. Another is the a way to defeat the immune system response to foreign cells, thus permitting colonies of the cells to survive in a different tissue without being destroyed by T cells of the immune system. A third essential mutation is that disables telemerase, the enzyme that clips off the last codone on the DNA. There are about 50 identical codones on the end of the DNA; when the last is used, senescence occurs (the cell will not split again). Each generation resulting from a cell mitosis will have one less than the previous generation. This mechanism limits the number of cell splits to about 50. And still another is the ability to become invasive. In cervical cancer a mutation in the cell-to-cell that causes the digestion of the adhesive molecule E-carherin permits the cancer to spread to distant tissues. For a single cell to become life threatening, it requires 5-to-6 mutations that disable these safety systems. There are 3 scenarios for speeding up the rate of mutations. One is a mutation in a single cell that disables one of the systems that checks to see that the newly formed DNA or RNA during mitosis is identical with the former DNA or the RNA to be produced. In a cell there are a number of such systems that perform this checking of the copies of DNA and RNA during cell division--some of them are peculiar to a certain types of tissues. With this system disabled, the rate of mutations (imperfect copies of the DNA or RNA) is increased that cell several fold. Second, for between 5 & 10 percent of the people one of the checking systems has been compromised in one of their parents and they inherited this imperfect system. This is often the cause for why a particular cancer will occur in a given blood line far above the norm. The third is environmental factors, namely mutagenic substances and radiation. The primary one is the breathing of air, especially when it is filtered through a lit cigarette. Consistent with other later studies, Ravenholt found that there were 450,000 premature deaths caused by tobacco, including 50,000 from second-hand smoke. In the press it is cancer that receives nearly all the attention as the major risk factor for cigarette smoker; that is misleading: more premature deaths are caused by coronary heart disease. 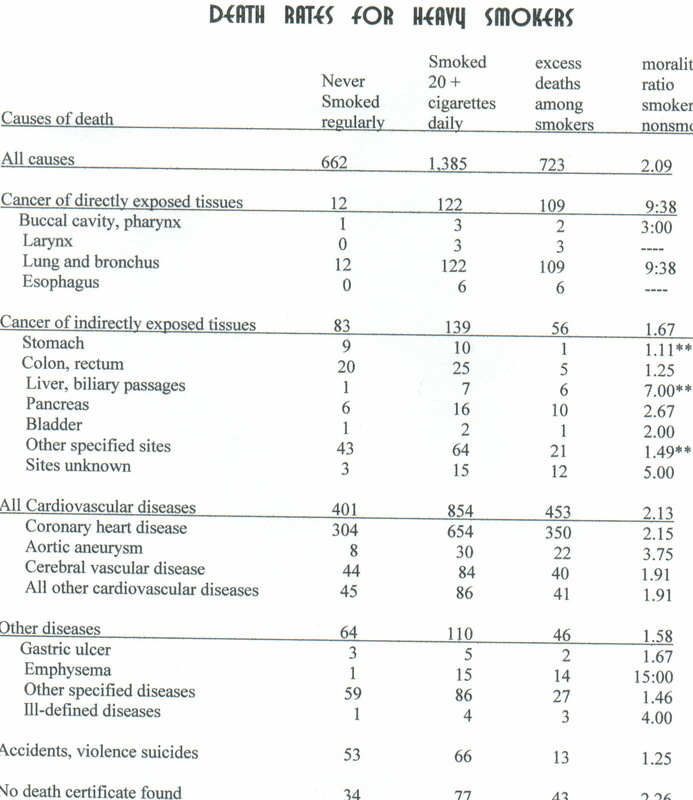 Of deaths in the study among smokers, 261 were by cancer and 854 by coronary heart diseasea ration of 3.27:1. There were 453 excess death (compared to nonsmokers) from coronary heart disease and 165 excess cancer deaths. Thus comparing the excess deaths, there were 2.74 times as many premature deaths caused by coronary heart disease than cancer in smokers. More people die of heart attacks than cancer. In smokers, there are 3.45 times as many deaths from coronary heart disease than cancer deaths; for nonsmoker coronary heart disease is 4.17 times likely to be the cause of morbidity. There were for the smoker 453 excess coronary deaths; a number greater than the coronary deaths among nonsmokers, which was 401, or a ratio of 2.13:1. The cancer ratio for exposed tissues was 9.17:1, and 1.67:1 for indirectly exposed tissues. Compared to the nonsmoker, for all causes in any given year the 20 + cigarette smoker was 2.09 times more likely to die. The major factor in the coronary heart disease for smokers is the reactive gas carbon monoxide, which initiates in the arteries a protective response that results in their being lined primarily with cholesterol and new artery cells, which results in the occluding of the arties. Thus for example, the reduction in the carotid artery internal diameter results in reduce blood flow to the brain and less oxygen, and this accelerates senility. The process of occlusion in arteries is greatly accelerated by prolonged heavy smoking. Moreover, studies have shown that this damage is not to any great extent reversed one smoking ceases. Among the foreboding population statistics are that the cigarette smokers live 7 years less than the nonsmoker, and that they shorten their lives by about 7 minutes for each cigarette they smoke. For those who quit, the number of minutes lost per cigarette decreases gradually, but is always well above those who never smoked regularly. On September 8th, 2002, a dear friend of 32 years, Terry, had shortened his life by 26 years (a man at the age of 52 is expected to live to be 78). He lost more than 7 minutes per cigarette. #35/id2. Smoking Tobacco: Its Statistical Consequences, a link thereto.